A loan of $675 helped to buy more inventory and have sufficient stocks of merchandise for sale. Asthere is 37 years old, is married, and has five young children, four of whom are attending school already (the youngest one hasn’t reach school age yet), she is very kind and popular among her neighbors and locals of the juru-bugesera community. For the past three years, Asthere has owned a small retail shop selling rice, beans, sugar, vegetables, soaps, and other basic goods without an employee--because she is a hard-working woman she can handle all these duties alone, Asthere is aiming for the expansion of her business, but she is constantly challenged with the lack of capital. So she is requesting this loan to have sufficient capital, buy more inventory, and have sufficient stocks of merchandise for sale. The profits generated by this loan will be saved and utilized to pay for her children's school fee and medical insurance. This is her fourth loan cycle with Visionfiund Rwanda. 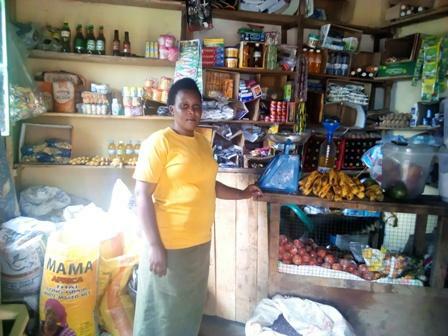 Consequently, Asthere is sincerely grateful towards Kiva lenders for allowing her this loan so that she can expand her business and improve her family's living conditions. It supports female entrepreneurs helping to rebuild Rwanda's economy. This loan helps low-income, women entrepreneurs in Rwanda grow their businesses and, ultimately, to support their families. These loans typically serve very poor and rural women, who often lack access to the traditional collateral needed for a loan. VisionFund Rwanda serves these entrepreneurs through both individual and group loans and provides them with financial education and tools for them to save money for the future. By supporting this loan, you are helping Rwandan female entrepreneurs build the means to support their families and improve their lives. VisionFund Rwanda (VFR), is the microfinance subsidiary of World Vision and is one of the largest microfinance institutions serving rural underprivileged communities in Rwanda, many of which do not have access to formal financial services. VFR serves people and communities that are economically productive but low-income, especially in very rural areas. This includes small business owners and salary earners who are looking for opportunities to provide better lives for their families and a promising future for their children. This microfinance institution incentivizes its loan officers to serve women and rural communities who have typically lacked access to financial services. It pays special attention to poor and underdeveloped areas by working with World Vision Area Development Projects. In addition to financing, it provides training in financial literacy, enterprise management and health basics through partnerships with other NGOs.